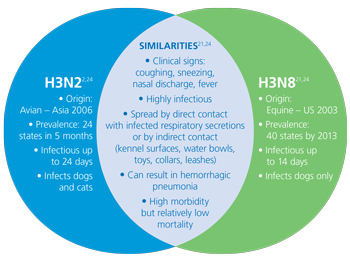 What is the H3N2 dog flu? The H3N2 dog flu is a respiratory-style virus that originated in Asia and first appeared in America in Chicago in 2015. The virus spread quickly through Illinois and into other states. There is another strain of the dog flu, H3N8. This one first emerged at a greyhound racing track in Florida in 2004, and actually comes from horses. Scientists believe the whole strain literally jumped species, according to the CDC. A venn diagram showing the two strains of dog flu, courtesy of Merck. What are the symptoms of H3N2 dog flu? H3N2 dog flu is very similar to kennel cough in terms of symptoms. They're both respiratory illnesses. The dog gets a cold and a cough and a fever. The cough is persistent, different from kennel cough. According to the American Veterinary Medical Association, the cough can last for 10 to 21 days despite anti-biotics. The virus also makes dogs more susceptible to secondary bacterial infections, which lead to worse illnesses. If left untreated, dogs can worsen and develop pneumonia. 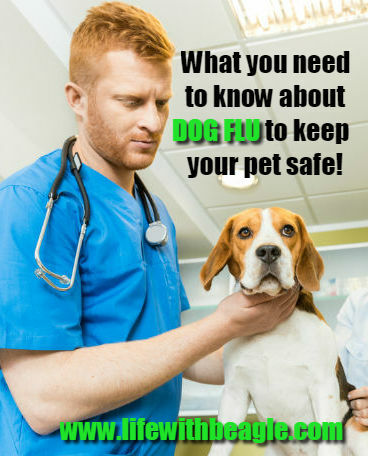 That requires a stay at an animal hospital, because the dogs need better treatment and it could lead to death, however the flu has a low mortality rate. How does my dog get H3N2 dog flu? Many of the dogs suffering from dog flu under UF's care took part in competitions, i.e. dog shows, agility or obedience competitions. Dogs pass the flu through direct contact. If a dog coughs or sneezes, for instance, that mist can travel 20 feet! It passes really well, not surprisingly, in places with lots of dogs, i.e. kennels, dog parks, day cares or boarding facilities, grooming places and yes, the vet. Not, the virus can easily be killed with soap and water, but it can live on surfaces that dogs use all the time, like dog beds, toys, water bowls, for 12 hours. Dog parks can especially be a problematic. Now, if your dog isn't out and about a lot, they are less likely to get the dog flu. Kiddie pools keep dogs cool during hot summer days at the dog park. But unless they are frequently cleaned they can also be a shared surface to catch the dog flu. How can I tell if my dog has dog flu? Because the flu is very similar to kennel cough or other respiratory illnesses, it's important to get your pet tested. If you dog has a persistent cough, is lethargic and has a fever, you should contact your vet. There is a diagnostic test they can do where they swab the nose and throat and get it tested. According to AVMA, the tests are most reliable within the first 4 days of the illness. After that the test is not as reliable and other measures may be needed. If you think your dog has the dog flu, call your vet before you bring them in. Because the disease is so contagious, they have special procedures they need to do to keep your dog away from other patients. They my bring you in and out through a special entrance, for instance. Isolation is key in stopping an outbreak. How do they treat the dog flu? Like any virus, treatment largely works to lessen symptoms and the duration. The best treatment for any virus is rest. Most dogs will recover within two to three weeks. Your vet may prescribe an anti-inflammatory to help bring down the fever. They may also prescribe an anti-biotic because of concerns about secondary bacterial infections, which could lead to pneumonia. You will be required to keep your dog isolated for four weeks. And if you have other pets, they need to be isolated as well. Should I get the Dog Flu Vaccine? There is a dog flu vaccine for both strains of the flu. However, the vaccine may not completely shield your pet from the flu. It essentially reduces the symptoms of the vaccine, and reduces viral shedding, essentially when the virus spreads into the environment. It's not recommended for every dog. If your dog is very active and social, it may be worth getting the virus. If your dog is not, then don't do it if you don't need to. If your dog is going to a boarding kennel, you may want to consider it, if nothing else to ward off the more severe effects of the illness. Can I get dog flu? What about my other pets? There are no reported cases of humans getting dog flu. However, cats have contracted the H3N2 dog flu only. So be aware of that. For more information, check out this FAQ from AVMA.